Russia will support India’s candidature for a permanent seat at the United Nations Security Council, if the world body agrees to expand the UNSC in both categories; of permanent and non-permanent members. India called the UN General Assembly’s move to adopt a text for UNSC reform a small but significant step forward. Russia was quick to allay Indian concerns about its support for a permanent seat at the UN Security Council, saying it would back India’s candidature on the Council. On a visit to New Delhi, Gennady Gatilov, Russia’s Deputy Foreign Minister, told Sujata Mehta, Secretary in the Indian Ministry of External Affairs (MEA), that Russia would back India for a permanent seat at the UNSC, once the world body decides to expand membership to the Council, in both permanent and non-permanent categories. UN General Assembly President Sam Kutesa convened a plenary meeting in New York last week to take action on the draft decision on the “Question of equitable representation on and increase in the membership of the Security Council and related matters”. During the meeting, he also circulated letters containing the positions of key countries, including Russia, the US and China, which refused to contribute to the negotiating text. There was no voting on the decision to continue text- based UNSC reforms in the 70th session of the General Assembly and it was adopted by consensus. Earlier this week, in a significant decision for UN reform, the UN General Assembly decided to carry forward the text presented by the President of the General Assembly on the issue of Security Council reform. The Indian government welcomed the move saying, “This is a significant development as after more than two decades of discussions, we can now commence text-based negotiations. Adoption of this text by consensus by all UN Member States is reflective of the broad support of the international community to move forward on this issue,” Vikas Swarup, MEA spokesperson said. Gatilov and Mehta discussed mutual priorities for the UNGA 70th session and stated proximity of approaches of the two countries on many of the issues being discussed within the framework of the UN bodies. In the context of analysing regional crises in the Middle East and the North Africa, special emphasis was given to the task to widely consolidate and coordinate international counter-terrorism efforts on a firm international legal basis under the UN aegis. They discussed common views on the significance of implementation of the Post-2015 Development Agenda and formulation of main parameters to hold the World Humanitarian Summit in 2016.Gatilov clarified Russia’s position on the UN text, stating Moscow’s position was not in any way aimed against India, when he held consultations with Mehta. They discussed a wide range of issues on the agenda of the 70th anniversary session of the United Nations General Assembly, due to begin next week. The officials discussed UNSC reform and exchanged opinions on main aspects of the inter-governmental negotiation process considering the current various options for the increase in the United Nations Security Council membership. Kutesa and Courtenay Rattray, Chair of the Intergovernmental Negotiations (IGN) process, decided to carry forward IGN towards a text-based negotiation process. The draft decision contains a negotiating text which has positions of UN member states on Security Council reforms and how the powerful 15-nation body should be expanded in its permanent and non-permanent categories. “It is our hope that with the adoption of this Decision, we will now move purposefully towards concluding our negotiations during the 70th Session, so that we fulfil the unanimous mandate given by our leaders in the World Summit of 2005 for “early reform” of the Security Council to make it, and I quote “more broadly representative, efficient and transparent and thus to further enhance its effectiveness and the legitimacy and implementation of its decisions,” Mukherji said. 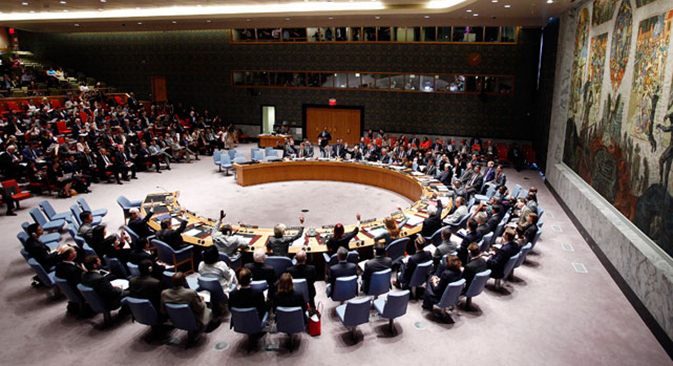 Optimistic Indian analysts said India could become a permanent UNSC member in two years. “The need for a supportive international peace and security environment is urgent, as our leaders meet in this Hall a few days from now to adopt Agenda 2030. If the Security Council continues to be ineffective, the lives of millions of people and the uninterrupted flow of trade, investment and technology, all of which depend on a stable and predictable global political environment will be jeopardized,” Mukherji said. India’s Prime Minister Narendra Modi will meet Russian President Vladimir Putin in New York next week, when both visit New York for the 70th session of the UNGA. Both leaders will almost be neighbours, as both are scheduled to stay at the famous Waldorf-Astoria hotel, now owned by a Chinese conglomerate.